Christmas is very much about tradition in our house. Every year, I make a Christmas cake, which without fail leads me to complain about the state of my oven and also that I have left it so late! Our turkey is bought from a farm en route to my parents house, tied with string, wrapped in grease proof paper, with a sprig of rosemary tucked in and all neatly packaged in a plain white cardboard box. We drink (too many) Kir Royales before Christmas lunch, my mum buys little table presents, which we open after our starter and there is always a mini panic about whether anybody has bought a table present for her. On Boxing Day, we always eat cold meat, homemade chips and pickles, with the wood burning stove roaring away. For years my Christmas season has begun with making my Christmas cards. I used to make them on the dining table, but nowadays I work in my little studio at the end of the garden, I light a scented candle and listen to the radio with a mince pie to hand. For me there is something completely absorbing and relaxing about the process of making! 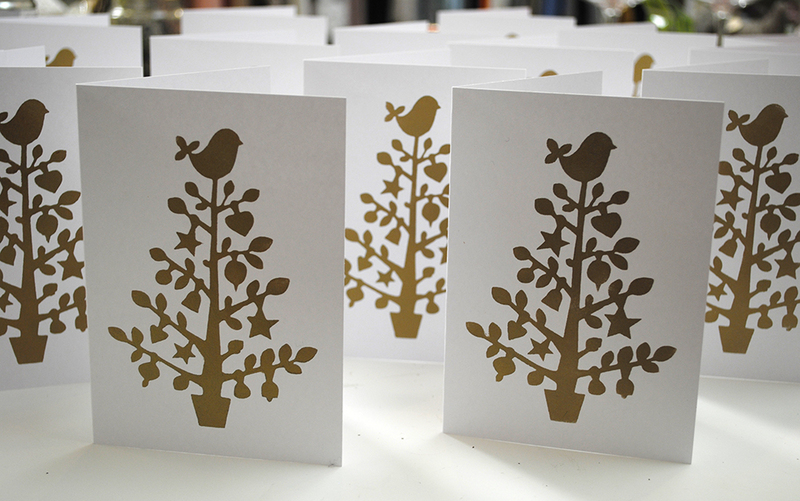 A couple of years ago, I made thirty very intricate paper cut Christmas trees to stick onto my cards. On reflection, it surprises me that I ever found the time to indulge in such a time consuming activity. 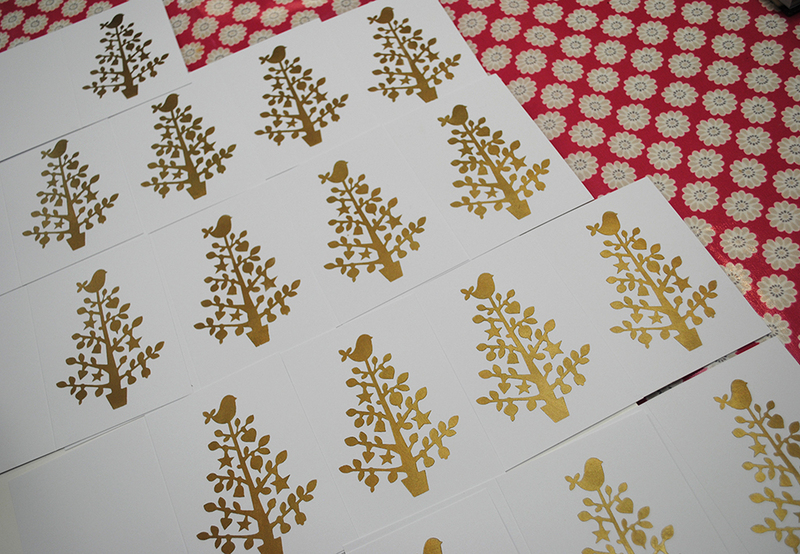 This year, I am making stencilled Christmas cards, which will be so much quicker. Stencils- I have used my Christmas Tree Stencil for this project. Spray Adhesive or Low Tack Tape. Paint for stencilling. (I used a metallic gold stencil paint, but Annie Sloan Chalk Paint™ in Emperor’s Silk work well). 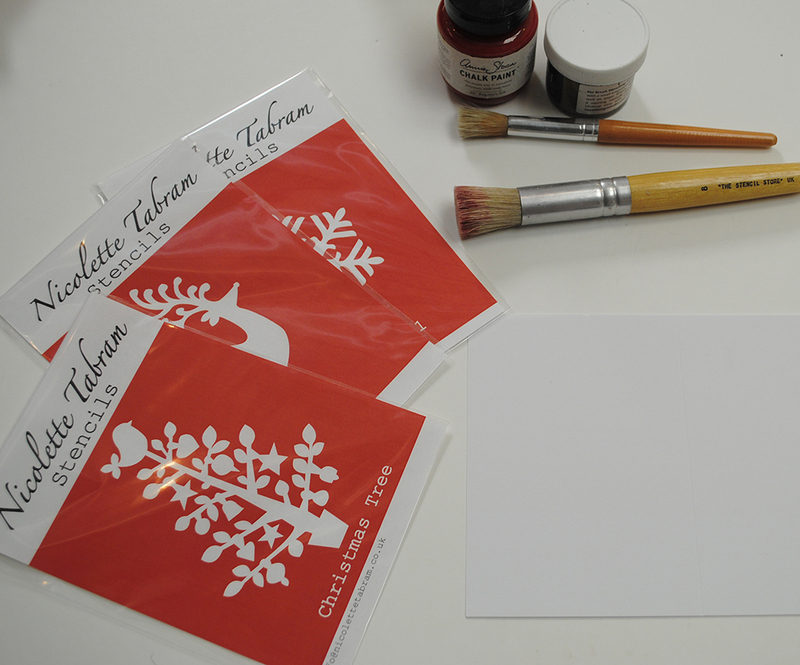 Lightly spray the back of the stencil and place in position on the blank card (you can use tape instead of spray adhesive). 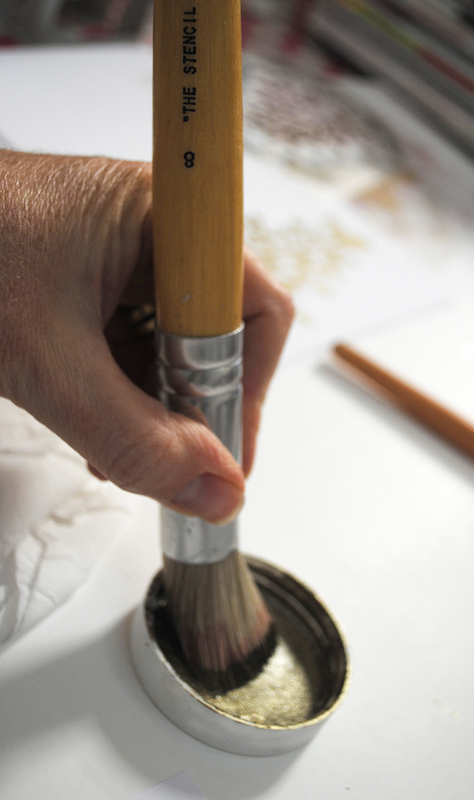 Dip the end of the stencil brush into the paint, removing the excess onto the paint pot lid or a paper towel. The brush should have very little paint left on it in order to achieve a crisp outline and to prevent paint bleeding underneath the stencil. Paint through the stencil using a soft circular motion. 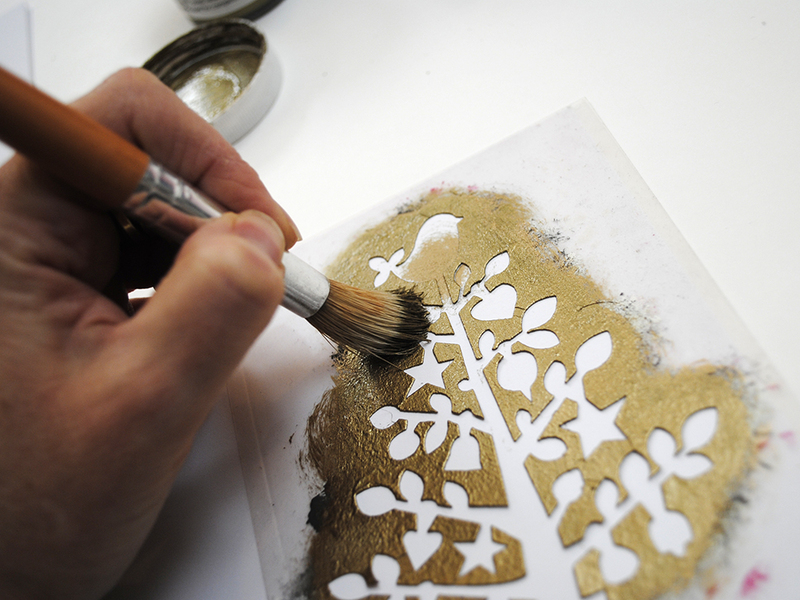 Carefully lift the stencil and repeat onto the next card. 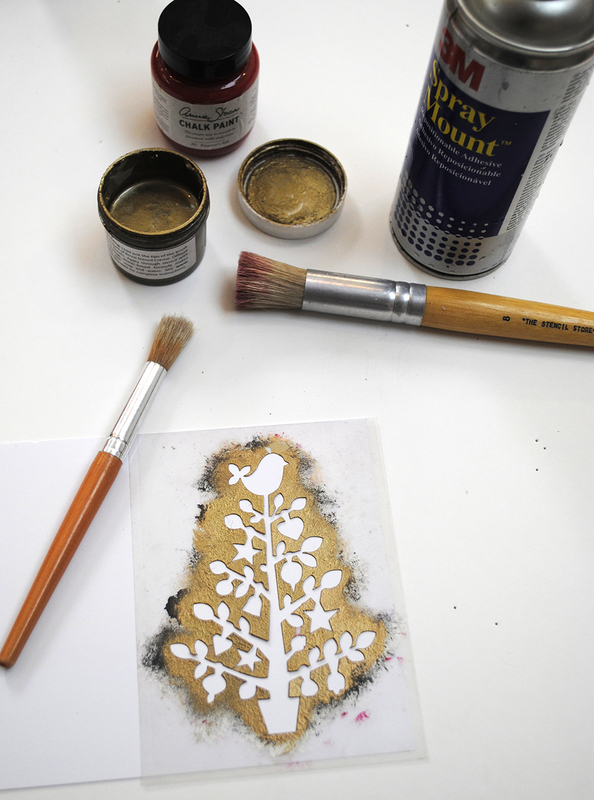 Stencilling cards is very quick, so make sure you have space to lay the cards out to dry. I loved reading this update and you have absolutely inspired me to make cards this year. Thank you for sharing how easy it is – I will be putting in an order for your stencils which look very beautiful. Is it really too early to put some Christmas music on whilst make them ???? I’m glad I have inspired you! Hey listen, it’s only 2 weeks till December, so put that Christmas music on!